While catching up on blogfriend visits this morning, I came across this easy (sounding, anyway) ornament project. I really like toile...even though I'm going for the pastel look this Christmas, they would be great package tie-ons, and I'm sure I can find a way to incorporate toile into my holiday decorating...the red and white would be great around Valentine's Day, too. 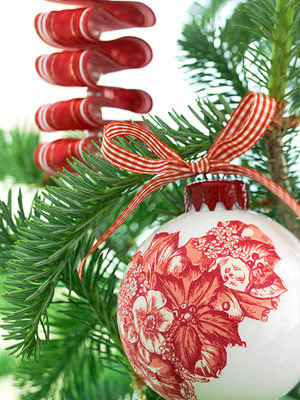 A piece of toile pattern trimmed from a dinner napkin and decoupaged onto a basic ball becomes an elegant ornament. 1. Remove the ornament tops and spray-paint some with red, others with white. 2. To steady the ornaments, place them top side down into the cups. 3. Cut out images from the napkins and lay them right side down into the palm of your hand. 4. Brush a thin coat of decoupage medium on the image, and carefully press it onto the ornament, smoothing wrinkles. 5. Allow ornaments to thoroughly dry in the cups. 6. Replace the painted ornament tops. Oh! How lovely! I am going to tuck that away and remember it! I don't have time this holiday season, but maybe during the summer for next year! How cute! I am always looking through BHG but I somehow missed that one! What a great idea! Darn, I don't have any red toil napkins though. I'll be looking for some now and give this project a try. Thanks!